IFA NEWS: Sony goes for second-room appeal with slim, lightweight S57 series portable TV | What Hi-Fi? 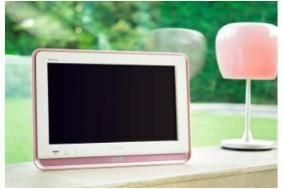 It's a 19in LCD model with a slimline, lightweight design for portability, comes in a choice of colours and has facilities including a USB input and a built-in illuminated digital clock. The S57 weighs just 5.4kg, and comes with a detachable carrying handle and stand. Digital tuning is built-in, as are two HDMI connections and a USB2.0 port, and there's a Photo Mode designed for the viewing of still images. Technology derived from larger Bravia models includes Bravia Engine 2 and Live Colour for picture quality, and the set also Sony's 24p True Cinema system for the best results from Blu-ray. In addition, there's a choice of Scene Select settings which optimise both picture and sound, for example for sports, cinema or games. The set comes in a choice of colours including Satin Silver, Silky Pink, Metallic Mocha or Pale Emerald.